If you are sole owner of the property, prepare or have your attorney prepare a new deed whereby you convey the property to yourself and your heir to be held as joint tenants with rights of survivorship. Most states recognize this manner of holding title such that upon your death, the property passes to the joint owner without the necessity of probating a will. Of course, once your heir acquires a one-half undivided interest in the property, you will not be able to sell or mortgage the property without his consent. If, however, you convey your undivided interest to a third party, you terminate your survivorship in the property such that the heir continues to hold his existing one-half interest with your interest passing via your will. As laws regarding joint ownership may vary from state to state, consult an estate-planning or real estate attorney prior to conveying property. If you have no qualms about your heir having full ownership of your property restricted only by your right to live on it during your lifetime, you can deed the property to him and reserve a life estate interest to yourself provided your state recognizes this form of ownership. Under a traditional life estate deed, your heir owns the property, but cannot terminate your right to live on it without your consent. At your death, however, your rights in the property automatically terminate and the property automatically passes to the your heir. 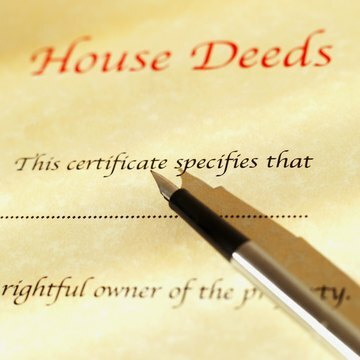 A few states also allow ownership under an enhanced life estate deed, often referred to as a “Lady Bird deed.” Under the Lady Bird deed, the life estate holder retains full ownership and control of the property including the right to sell or mortgage it without the heir’s consent even though he is the remainder owner. At your death, however, provided you haven’t sold the property, ownership passes directly to your heir. Consult an estate-planning attorney regarding the impact of life estate interests on property in your state. If you have executed a durable power of attorney appointing an attorney-in-fact to act on your behalf, the attorney-in-fact may deed property to your heir upon your mental disability or incompetence, provided you have instructed him to act in this manner under the terms of the document. If, however, your intended heir is one and the same as your attorney-in-fact, the deed may be set aside by a court of law in a state that prohibits self-dealing under a power of attorney. Self-dealing would include any action by the attorney-in-fact that would cause him to benefit personally from the transaction. If you have neglected to convey an interest in the property to your intended heir during your lifetime, he may have to acquire his share through probate of your will and subsequent executor’s or personal representative’s deed after your death. If you leave no will, property passes according to your state’s laws of descent and distribution. If your estate is administered in probate court without a will and your heir is entitled to the property, he may acquire an administrator’s or personal representative’s deed for recording in the real property records for the state where the property is located. In West Virginia, your spouse can inherit from you under the terms of your will or by laws that govern inheritance. Although some of these provisions are automatic -- for example, you cannot disinherit your spouse -- crafting an estate plan can help ensure your assets are distributed as you wish, without any unintended consequences.